From decoupage nameplates to up-cycled glass bottles, Art Delight is a home decor brand that serves up handcrafted decor accessories one cute item at a time. Only nine months old, Art Delight is a brand that has our attention for its cutesy accessories that will brighten up any home. We spotted a wooden desk calendar with labels for the month, day and year that would look good in any office or study. We also found a quirky hand-painted wall hanging with a mason jar attached to it that could serve many purposes. From filling them with flowers to storing other knick knacks, it makes for quite the versatile wall instalment. Apart from this, they make other home accessories key holders, coasters and customised nameplates using mediums like decoupage, painting and upcycling, to bring something unique and quirky to the table. Get your own customised decoupage or hand-painted nameplate, that would be a fitting greeting to all your houseguests. Or find a pinterest-worthy upcycled glass bottle to put on your coffee table. Prices are at INR 50 and upwards, depending on the product, order and customisations. You can find their stuff online on websites like lovethisstuff or get in touch with them on Facebook here. Started by software engineer, Rimjihm, the decor brand entirely fuelled by a passion for arts and crafts that she feels must be shared. And so Art Delight frequently hosts weekend painting parties. These workshops that let you indulge in the joys of art and painting and provide you with a little guidance and technique along the way. Open to people over the age of 14, these painting parties are a great way to unwind and get in touch with your inner artist. 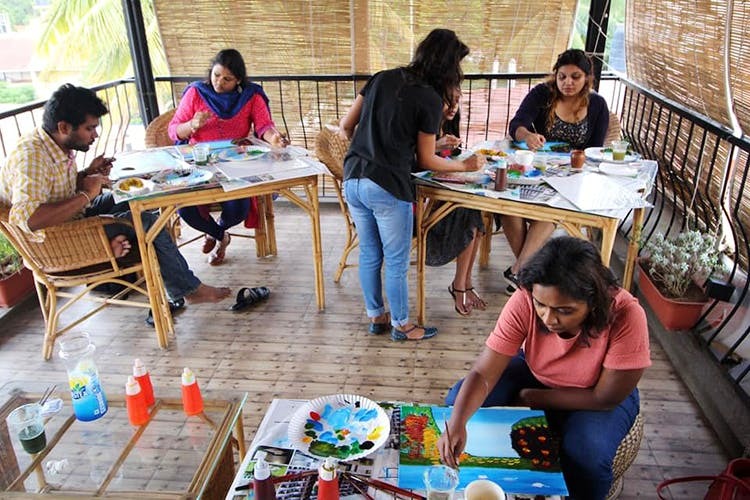 The workshop is 2 to 3 hours long and prices start at INR 1,000 per person. Happening at different cafes across the city, find out where and when the next one is scheduled by staying tuned to their Facebook Page. See you at the next one.